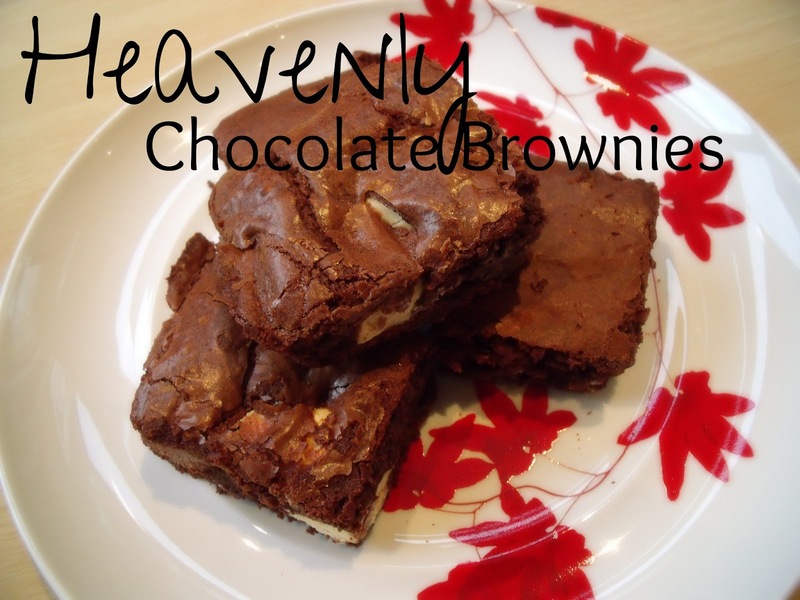 These are, quite frankly, the best brownies ever! And I am gutted that since going dairy free I can't eat them. But, you know, it would be cruel of me not to share them with you just because I can't have them. I once sent my husband to work with a batch of them and he was asked to bring more, whilst someone else suggested I go into business selling them. So that should give you an idea of how good a recipe this is! It's not my own recipe, I did find it somewhere on the internet, however I can't remember where so apologies for the lack of linkage. But I'll share it with you, just because something so good shouldn't be kept to oneself. 1. Cut the butter into small pieces and tip into a bowl. Break the dark chocolate up and add to this. Fill a small saucepan with water and put on a low heat, placing the bowl on top so it's not touching the water. Stir occasionally to mix the butter and chocolate together as it melts. Remove the bowl and leave the melted chocolate to cool. 2. Preheat the oven to 180C/ gas mark 4. Line a 20cm square tin with baking paper. 3. Sieve the flour and cocoa powder into a medium sized bowl. Chop the white and milk chocolate up into small chunks and put aside. 4. Break the eggs into a large bowl and tip in the sugar. Using an electric mixer, whisk together until it is thick and creamy and leaves impressions on the surface when you dribble some across it. (This can take a few minutes). 5. Pour the cooled chocolate mixture over the eggy mousse and gently fold together with a spatula. Do this until the mixtures are one and it's a dark, mottled brown. 6. Hold the sieve over the large bowl and resift the cocoa and flour over the eggy mixture. Gently fold this in. It will end up looking nice and fudgy :0) Finally, stir in the chocolate chunks. 7. Pour the mixture into the tin and put in the oven for 25minutes. When it's done, take it out and jiggle the pan slightly. If the brownies jiggle too, it needs another few minutes. One of my batches I didn't quite cook for long enough and it didn't bind together properly. Still tastes lovely, but falls apart when you try to cut it into squares! 8. Leave to cool before cutting into squares. These are best eaten warmed up for 20secs in the microwave, and if you're feeling indulgent, a scoop of vanilla ice cream to boot! Enjoy! I so wish I wasn't on cake avoidance at the moment! And I wish I hadn't gone dairy free! Lol, although I've had a think of a way to make it without milk products so I might give it a go! I keep trying different brownie recipes and will definitely have a go at this one. Probably my favourite cakey item ever. I have never made brownies before. So will definitely be looking to make these soon. Not sure they will last very long in our house though! I CAN NOT believe you've never made brownies before! You have been missing out!